Spring is in the air, citrus fruits have hit the shelves again and we're all gearing up for outdoor lunches and fresh, seasonal goodness. We might be getting slightly carried away (the winter coats are still firmly on, and we had vegan stew for lunch today), but the arrival of grapefruit is a sure sign of what's to come. A breakfast staple growing up, they're the perfect light option for warmer days, lightly grilled with a drizzle of honey. Or stew them with honey and add to your porridge in the mean time. The largest member of the citrus family, grapefruits are large and thick-skinned with a juicy inside. They got their name from how they grow (in grape like bunches) and come with either white, pink or ruby flesh - the latter tending to be the sweetest. Their flavour is sweet but bitter, complimented by the addition of honey for a sweet option, or boding well against leafy greens in savoury dishes. 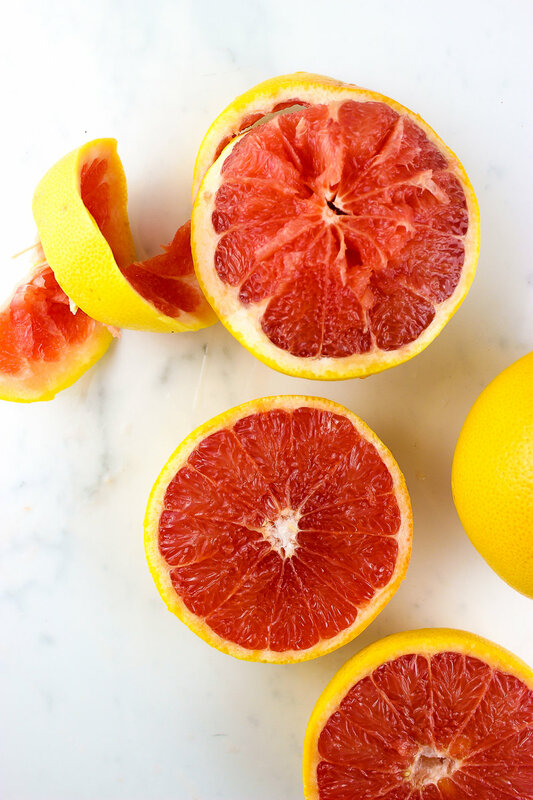 Choose grapefruits with a plump appearance that feel the heavy when picked up - they'll be the juiciest of the bunch. Add them to your diet when you're feeling run down to benefit from their high vitamin C levels, or eat them when you're in need to a sweet fix - their low GI levels means they won't affect your blood sugar levels are much as other fruit. - Need a new salad combination? Add slices of grapefruit to a salad of rocket, avocado and prawns for a spring staple. - It's great for dressings too. For a super simple dressing, mix the juice with olive oil, himalayan salt, honey and mustard. - Grapefruit pudding, whilst traditional, is the perfect dessert with a few changes - think of it as crumble with a cake topping. Line a casserole with sliced grapefruit drizzled with honey, then top with a cake mixture (we tend to use a mix of ground almonds, eggs, honey and baking powder) then bake for 20-25minutes. - It also adds another element to other cake mixes too. Try adding grapefruit juice to banana bread mixture, and top the loaf with slices before baking to let the juice seep through and caramelise.